Did the major clinical trials of statins affect prescribing behaviour? Drs. Mamdani and Tu are with the Institute for Clinical Evaluative Sciences, Toronto, Ont. Dr. Mamdani is also with the Faculty of Pharmacy, University of Toronto, Toronto, Ont. Dr. Tu is also with the Faculty of Medicine, University of Toronto, and with the Division of General Internal Medicine, Department of Medicine, Sunnybrook & Women's College Health Sciences Centre, Toronto, Ont. Randomized controlled trials (RCTs) have clearly demonstrated that cholesterol-lowering statins are beneficial in the treatment and prevention of coronary heart disease. Although recent evidence indicates that major RCTs of statins have significantly influenced physicians' prescribing behaviour,1 it is uncertain whether physicians have interpreted the results as a class-specific or a drug-specific effect. We investigated whether the release of 3 landmark RCTs of statins, namely, the Scandinavian Simvastatin Survival Study (4S),2 the West of Scotland (WOS) trial3 and the Cholesterol and Recurrent Events (CARE)4 trial, and the release of atorvastatin were associated with the market share of different statins in Canada. Prescribing patterns were examined for July 1993 through June 1999, with the aim of identifying any immediate changes following the release of the results of the RCTs and the release of atorvastatin. An immediate change was defined as a significant shift in prescribing pattern (i.e., changes in the monthly proportion of prescriptions attributable to each statin within the class) from projected estimates within 5 months of the intervention being assessed. Although outcome-based studies examining atorvastatin had not been published during this observation period, atorvastatin had been shown to improve secondary end points, such as low-density lipoprotein levels, to a greater extent than the other drugs in its class.5 National estimates for monthly statin prescriptions dispensed in Canada were obtained from the Compuscript database of IMS Health Canada, which samples approximately two-thirds of all retail pharmacies in Canada. Time series analysis6 was conducted using interventional autoregressive integrated moving average (ARIMA) models to determine the impact of each intervention on the market share of the different statins. The monthly number of statin prescriptions dispensed rose by 236% from about 166 000 in July 1993 to about 557 000 in June 1999. The release of the 4S study2 was associated with an observed positive shift in the market share of simvastatin (p = 0.04), an observed negative shift in the trend of pravastatin (p = 0.03) and no immediate changes in the market shares of fluvastatin (p = 0.77) and lovastatin (p = 0.13) (Fig. 1). Fig. 1: Statin market share (A) and the number of prescriptions dispensed (B) from July 1993 to April 1999 in Canada. The publication dates of the 3 randomized controlled trials and the time of the release of atorvastatin are shown by the vertical bars. The 4S study, which was published in November 1994, demonstrated the benefits of simvastatin in patients with myocardial infarction (MI) for secondary prevention. The WOS study, published in November 1995, reported significant benefits for pravastatin in the primary prevention of coronary disease. The CARE study, published in October 1996, demonstrated the benefits of pravastatin in patients with MI for secondary prevention. Atorvastatin was released in April 1997. The 4S study resulted in an increase in simvastatin use by approximately 4200 prescriptions per month from the expected values in the first 3 months following study release. The corresponding figures for increases in pravastatin use following the release of the WOS and CARE trials were 7000 and 8300 prescriptions per month respectively. In contrast, the WOS study was associated with an observed positive shift in the market share of pravastatin (p < 0.01) and no significant observed changes in the market shares of fluvastatin (p = 0.39), lovastatin (p = 0.65) and simvastatin (p = 0.81) (Fig. 1). The CARE study was associated with an observed positive shift in the market share of pravastatin (p = 0.01), a negative shift in simvastatin (p = 0.01) and no significant changes in the market shares of fluvastatin (p = 0.46) and lovastatin (p = 0.90) (Fig. 1). The release of atorvastatin was associated with more gradual negative shifts in the market shares of simvastatin (p = 0.01) and lovastatin (p < 0.01) and a more immediate negative shift in the market share of pravastatin (p = 0.04). No significant effects were observed in the market share of fluvastatin (p = 0.27). The market share of atorvastatin increased from 0.9% in April 1997 to a top position of 39.2% in June 1999 (p < 0.01). Although the overall prescribing of statins in Canada has increased dramatically over time, the publication of each major RCT was associated with a significant positive shift in the market share of the statin featured in each trial. These results suggest that physicians may have initially subscribed to a drug-specific rather than a class-effect belief when prescribing statins. A major limitation of this study was the lack of information about promotional expenditures and methods.7,8 These factors may have also accounted for changes in market share. 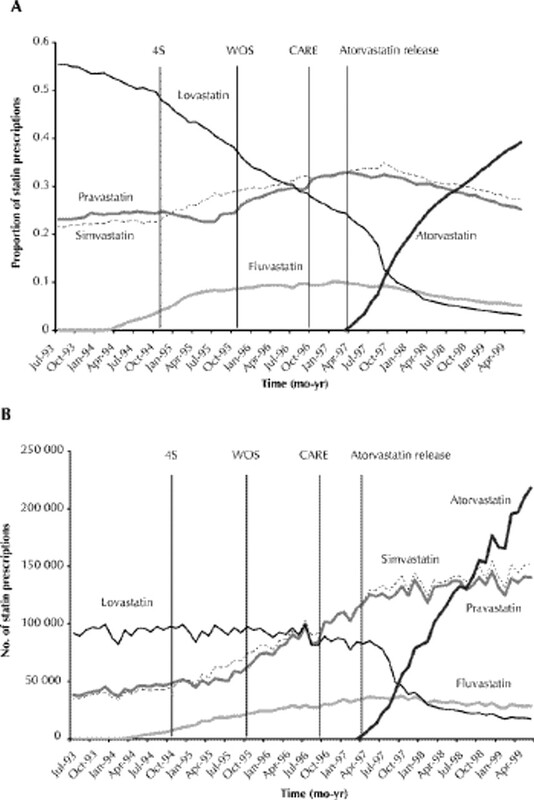 The release of atorvastatin was associated with a relatively gradual, yet pronounced, shift in prescribing practice, which may in part be a reflection of competitive pricing or of favourable findings from clinical trials5 measuring surrogate end points, such as laboratory values. Drug prescribing is influenced by numerous factors. Our findings suggest that the results of the landmark clinical trials of statins and the introduction of new agents may be among these factors. Dr. Tu is supported in part by a Medical Research Council of Canada Scholar career award. Contributors: Dr. Mamdani, the primary author, contributed substantially to the conception and design of the study, to data acquisition and analysis, and to the writing of the manuscript. Dr. Tu contributed to the conception and design of the study, to data analysis and interpretation, and to the writing of the manuscript. Baxter C, Jones R, Corr L. Time trend analysis and variations in prescribing lipid lowering drugs in general practice. BMJ 1998;317:1134-5. Scandinavian Simvastatin Survival Study Group. Randomized trial of cholesterol lowering in 4444 patients with coronary heart disease: the Scandinavian Simvastatin Survival Study (4S). Lancet 1994;344:1383-9. Shepherd J, Cobbe SM, Ford I. Prevention of coronary heart disease with pravastatin in men with hypercholesterolemia. N Engl J Med 1995; 333:1301-7. Sacks FM, Pfeffer MA, Moye LA, Rouleau JL, Rutherford JD, Cole TG, et al. The effect of pravastatin on coronary events after myocardial infarctions in patients with average cholesterol levels. Cholesterol and Recurrent Events Trial Investigators. N Engl J Med 1996;335:1001-9. Jones P, Kafonek S, Laurora I, Hunninghake D. Comparative dose efficacy study of atorvastatin versus simvastatin, pravastatin, lovastatin, and fluvastatin in patients with hypercholesterolemia (the CURVES study). Am J Cardiol 1998;81 : 582-7. Pindyck RS, Rubinfeld DL. Econometric models and economic forecasts. 4th ed. New York: Irwin McGraw-Hill; 1998. ch. 15. p. 489-601. Kessler DA, Rose JL, Temple RJ, Schapiro R, Griffin JP. Therapeutic-class wars — drug promotion in a competitive marketplace. N Engl J Med 1994;331:1350-3. Furberg CD, Herrington DM, Psaty BM. Are drugs within a class interchangeable? Lancet 1999;354:1202-4. You are going to email the following Did the major clinical trials of statins affect prescribing behaviour?